The 2nd, 4th, 5th and 6th regiments participated in the 1809 campaign in central Germany as part of Rouyer's Division. Many Rhinebund units also participated in the war in Spain as well, a very unpopular assignment as might be imagined! The 7th Rhinebund or Mecklenburg-Schwerin regiment participated in the Battle of Borodino, which we will be be running as a game using Filed of Battle 2nd edition rules at Historicon this July. This lead to the need to field this relatively obscure unit for the battle. The Duchy of Mecklenburg-Schwerin was located on the Baltic coast of North Germany, bordering Hoilstein (Danish) and Swedish Pomerania. It was one of the last states to join the Confederation of the Rhine, as a result of a treaty signed in March, 1808. It was also one of the first to leave the Rhinebund in 1813; doubtless Napoleon's offer of the Duchy to the New Crown Prince of Sweden, former French Marshal Bernadotte, in 1812 as an inducement to join the alliance against Russia did little to endear the French to its ruler, Duke Frederick Francis I. Mecklenburg troops thus fought against the French in 1813 and 1814. It didn't get much more respect form Russia and Prussia, who then proceeded to offer the Duchy to Denmark! Ultimately, however, the Duchy survived intact, however. It was said to be relatively poor. The population according to the census in 1819 was roughly 388,000 people. There is surprisingly complete information on the organization and uniforms of the 7th Rhinebund regiment here on the Histofig site. By 1809, the regiment followed the general French organizational pattern, with 4 Fusilier, 1 Grenadier, and 1 Voltigeur company per battalion, and French style company distinctions. The uniform still showed fairly heavy Prussian influence (Brandenburg lay just to the South), the troops wearing a double breasted dark blue coat without lapels, red cuffs and turnbacks, and grey pants. The color of the collar originally varied by battalion., the 1st having yellow, the 2nd white, the 3rd red, and the 4th peach. This was soon changed to the same boring red for all battalions - a shame, that, for us painters! Gavin had these lovely large 28mm Front Rank figures painted by his friend, Phil, and a very nice job he did indeed! Each battalion has 24 figures, the first rank in firing position and with the Grenadiers in red plumes, cords, and epaulets, and the Voltigeurs with green. Fusilier company pom-poms the same as in French units. The drummer has red wings, and in full dress would have red/blue/yellow lace decorating the wings and facings; the same pattern of colors is on the drum rims. The cockade for Meckelenburg is seen on the front of the shakos - red within blue within yellow. the brass plate on the front of the shako bore the ducal arms. This rear view shows even better what a nice job Phil did painting these units. The white flag bears the arms of Mecklenburg, a state dating back to about 1300 AD, although by this time the original territory had been split into Mecklenburg-Schwerin and Mecklenburg-Strelitz. - I particularly like the Bull, which is one of the supporters of the arms! A final, close up view of the 1st battalion, 7th Rhinebund regiment. The mix of French and Prussian influences can be clearly seen in this unit! Map of the area Germany containing the Rhine Confederation states in 1812 (from wikipedia). Mecklenburg-Schwerin is on the Baltic ("Ostsee"), in grey. Where the slow match glows and men plunder! 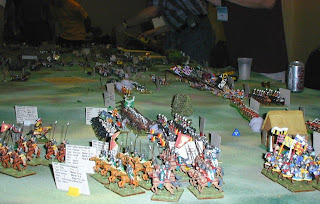 Wargamer Rabbit (aka Michael) had a nice post on the Rhinebund regiments on his own blog ("the Warren") a few months ago; check it out if you missed it then and are interested in some of the other Rhinebund units yourself! Hostile Realms wargames rules and... Lord Kalvan of Otherwhen! 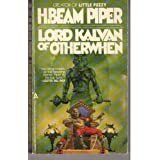 For any of you not familiar with it, the original story (Lord Kalvan of Otherwhen) was by the late H. Beam Piper, and is a great yarn. The basic premise of the series is that Calvin Morrison, a Pennsylvania State Trooper, is accidentally caught up in a paratemporal transport device, and deposited in a Pennsylvania contemporaneous but parallel to ours, radically different than here-and-now, because of the impact of events that went differently than in our own time-line, chief among them being that the great Aryan migrations went East across the Pacific land bridge rather than West into Europe and the Middle East. The technological level of the timeline is roughly equal to that of the late 1500’s. In the particular sub sector that Calvin finds himself thrown into, a theocracy has developed based upon the closely held secret of Gunpowder composition and manufacture. The House of Styphon has ruthlessly used it’s stranglehold on Gunpowder, as well as its resultant great wealth, to manipulate kings and kingdoms for their benefit and profit. Calvin arrives in the beleaguered Kingdom of Hostigos, under attack by the allies of Styphon. Dubbed “Lord Kalvan” by the Hostigi, he brings his 20th century knowledge to bear, and sets up manufacture of superior gunpowder (which is called “fireseed” in this setting), as well as introducing other innovations. In addition to frustrating the machinations of Styphon’s House, he makes an undying enemy of the priesthood by revealing the Fireseed secret to all the nations, free, as well as confiscating the vast wealth of the temples of Styphon in the territories of the kingdoms he defeats. After suffering a series of stunning reverses, Styphon’s House has pulled out all the stops. They have recruited, bribed, and otherwise assembled the biggest army ever seen in Otherwhen North America, the “Grand Host of Styphon”, in order to defeat the “usurper” Kalvan once and for all. Composed of troops using a great variety of combat styles, and driven by Roxthar, Chief Investigator (think the Spanish Inquisition, only worse) and High Priest of Styphon, the stage is set for a battle of epic proportions. (A slightly different version of this report is posted at John's Hostigos.com site under "Wargaming"). Roxthar bearing a burning brand to assist in motivating the subjects of his “investigation”, and a typical High Priest of Stytphon, living off the fat of the land! We had a great turnout for the game, run at Historicon in Lancaster, PA, in 2008. I think we had about 10 players.Here my Band of Brothers 2nd edition co-author, Ken Baggaley considers his deployment. He and his son, Brian, had the Styphoni right wing. This consisted of Ros Zarthani mercenaries (think Late Romans or Byzantines) and the very tough Ros Zarthani Knights (think Teutonic Knights, in this case a Military Order that is part of the military arm of Styphon, the other part being the Temple Guards). Joe and Barry can be seen re-hydrating after the intense work of setting up the game whilst looking on as the Sacred Squares of Hos Ketmos (think Spanish Tercios) complete their deployment, supported by the Halberd armed Temple Guards on the ridgeline. View of the Right wing of the Grand Host of Styphon! Here is a long view of the table, with the Styphoni Left flank also completing final deployment. The walled Villa to the front of Kalvan’s line is fortified and crammed with heavy guns, destined to take a heavy toll from the enormous but densely packed Sacred Squares opposite them, which advanced upon the Villa with ponderous slowness. The Left wing of Kalvan’s army, including half of his Royal army (represented by English Civil War type troops) as well as the Pricely army of old Hostigos and the relatively primitively armed Uthori infantry (mostly crossbows and halberds). The generals of the Left wing appear confident in their deployment, designed to maximize their considerable advantage in firepower, don’t they? An earlier playtest suggested that Kalvan's forces needed fewer numbers but better firepower, so I tweaked the stats a bit for this game. Here is Kalvan’s Center, Reserves, and right wing, with their Generals. These guys don’t look nearly as confident of their situation, do they? More Royal Infantry, the afore mentioned guns, and assorted mercenaries comprise the Center, while Queen Rylla and Sarask of Sask hold their forces in reserve on the ridge. On the far right is the Uthori Cavalry “Iron hats” plus the princely infantry and cavalry of Nostor and Kyblos. The numerous small cards seen on the table have the statistics for each unit and leader. The color of the base is the same for all units of a command group, as well as the leaders. While a bit less scenic, these cards greatly facilitated play. Hostile Realms, by yours truly, was published in 2009 and uses (essentially) the Initiative system of Brent Oman’s Field of Battle. That is, the opposing Commanders in Chief (in this case Great King Kalvan and Captain General Phidestros, commander of the Grand Host) dice off against each other using their Leadership Die (LD). Kalvan was rated the best possible, D12+1, while Phidestros merited a competent D10. The difference in scores is the number of cards that each side will be allowed to turn and act on for that phase, with the high scorer choosing to go first or second. As a rule, the Hostigos forces tended to have better Command Group and Wing Leaders, although this was not universally true. Again like FoB, each time a MOVE card is turned, ALL the Command group leaders for that side roll their individual Leadership Die against an opposing six sided die. A LD roll of 1 means no movement for that Command Group on that card. Otherwise, a difference of up to 3 means one Move segment for that command, a difference of 4, 5, 6, or 7 results in 2 move segments, and a difference of 8 or more grants 3 segments. If a Command Group wins 2 or more segments, they can use one of them to change facing or formation, and some types (like Pike Blocks and most Cavalry) can use such a segment to resolve Melee (hand to hand combat) immediately. The Wing Leaders were permitted to re-roll for ONE of their command Groups on each card at the discretion of the player. The battle opened with Kalvan winning the first die roll (actually, I think he won almost all of the rolls the entire game). With his main strength being firepower, and the enemy being mostly out of range, he opted to let the Grand Host of Styphon (GHS) go first, rather than risk turning RELOAD cards that would be wasted with the enemy out of range. The right wing, under the command of Brian and Ken Baggaley, had very good leaders and excellent LD rolls. It stepped off to the attack with alacrity, while the Sacred Squares in the center lumbered slowly forward. On the left of the GHS, the leaders were rather poor and rolled many “1’s”, and were thus unable to take effective action. When the initiative passed on to Kalvan’s forces, they were fortunate to turn a number of RELOAD cards, both artillery and small arms, and, the enemy now coming in range, their fire caused devastation among the serried ranks of the Sacred squares, as well as the perhaps over boldly handled Ros Zathani cavalry. Insult was heaped upon injury when the forces of Hos Hostigos turned the one BRILLIANT LEADER card in their deck, declaring it another Infantry Relaod card, thus allowing the Royal foot of their Left to mow down more of the Ros Zarthani cavalry, their bows proving a poor response to the highly accurate Musket fire of the enemy. A MOVE card followed, and the infantry of the Left formed a salient to enfilade the hapless Ros Zarthani. Seizing the moment, the Kalvan’s elite Royal Cavalry galloped forth in a hell for leather charge upon the weakened Zarthani Kataphractoi, firing their pistols as they closed. Although their ranks had been thinned by the earlier musketry, the Kataphractoi seemed delighted to finally have an enemy that they could actually fight. Their heavier armor (and superior die rolling) promptly routed the Royal Horse, and they went streaming for the rear. Indeed, in this game each time an (on paper, excellent) Royal cavalry regiment charged enemy horse, it was soundly defeated. Maybe the Lance isn’t obsolete yet after all! Despite the failure of their Cavalry, the continued deadly firepower (and hot dice for firing) lead to the Left Wing of the Hostigos army soundly defeating the forces of Styphon, the entire wing eventually retreating off the boardcafter it ran out of Morale chips and then flubbed an Army (wing) morale check by a large margin. Meanwhile, the Hostigi Right wing got off to an initial fast start, winning a number of cavalry melees against the princely forces of Ketemos and its supporting troops. Kalvan’s right wing actually advanced rather aggressively, in part because the quality of the Leaders on the Styphoni left left almost as much to be desired as there poor die rolls! Then, realizing that the friendly troops were getting awfully close to the Enemy, the high priest of Priest of Dralm cast the powerful Level 4 spell, “Lightening Storm” upon the opposition. It did a moderate amount of damage to the troops within its 12 inch radius, but was not decisive. This spell represents a stratagem used by Kalvan in the book. He had selected the battlefield carefully, and dammed up a substantial stream, the water of the resultant lake being hidden behind the ridge line he occupied. At the right moment, the dam was to be blown, releasing a torrent of water, trees, rocks, and mud upon the enemy. Not a great photo, but to the left is a priest of Galzar, the War god, in his wolf headdress. To the right is a Priest of Dralm, the All-father. Despite this artifice (and a few lesser “Hailstorm” spells subsequently, which had very little effect upon the minions of the Gunpowder God), the forces of Styphon gradually rose to the occasion. Their own Priest of Galzar “Blessed” several of their remaining cavalry units, and this seemed to have a most salutary effect, gaining the upper hand in a series of hotly contested melees. The nearly unstoppable Sacred Squares of Hos Ketemos (Tercios) took a a heavy pounding as they slowly advanced across the field, one Tercio suffering 14 stands loss and STILL passing a Morale Challenge! Fortunately for the forces of King Kalvan, the Center command ran out of Morale chips just before the Sacred Squares came within range of Kalvan's battle line (the commanding general couldn't manage to win more than 1 move segment on a Move card). With the victorious Hostigos left flank sweeping down upon them (after the Styphoni right wing failed their Army (Wing) Morale check big time, the game was declared a victory for the forces of the former uptime Pennsylvania State trooper. All hail Great King Kalvan… and Down Styphon! If you've never read this classic H. Beam Piper story, I would highly recommend it to you, as well as the excellent and much lengthier sequels by John Carr, himself a wargamer (see Hostigos.com for information). Barry, who was my chief local playtester, looks up some modifiers. Broad view of the filed. This battle had so many units and leaders that the labels on the table, while not the most attractive thing in the world, were necessary to both identify the units and give their stats and command structure (all leaders and units in the same command have the same color label holders). The action is general, and... here are the Generals! For reference and those interested in the rules, here are all the key tables from the rules. Yes, there are quite a few of them, but they are quite easy to use once you play for a short while! Shield Wall reduces movement 50%. Boots of Speed increase move distances 50% Routers move at Road Column rate. Open None None None Up one die type if opposing unit only is in Class I. Stop at contact, then ½ speed (Skirmish Order, Characters full speed). EHC, War Wagons, Engines of War treat as Class IV. Chariots may not enter or melee into Class III. Down two die types for firer. Down one die type for Attacker. PB, EHC, War Wagons, Engines of War, and Chariots may not enter or melee. Down three die types for firer. Down two die types for Attacker. Uncrossable mountain, Fort, Impassable water or cliff, bridge, etc. Impassable to all. No move, other than by road. As above. No melee. *Note that gunpowder weapons treat all targets as having No Armor! # Inferior Position = in a stream or ditch against units behind same; Downhill; Enemy charged downhill. Units firing while mounted are restricted to Point Blank, Short, and Medium ranges. Musket range bands are PB 0-3", Short 3-6", Medium 6-9", and Long 9-12"
Rifled Musket Range Bands are PB 0 - 4.5", Short 4.5 - 9", Medium 9 - 13.5", Long 13.5 - 18"
Should an Organ Gun roll a natural die score of "1" when firing and the target D6 roll is a 4, 5 or 6, the guns explode and are removed from play! 1 – 2 Hits = War engine/Gun is unformed. 3 – 5 Hits = War engine/Gun is disordered. 6 – 8 Hits = War engine/Gun is disordered and suffers a wound. 9+ Hits = War engine/Gun is destroyed. Remove the unit from the table. Note that Artillery/War Engines and unwounded Champions (having only 2 Wounds), and Heroes (having only 1 Wound), will count the modifier for -2 wound difference or -3 wound difference respectively, when fighting an unwounded (4 Wound) unit. Pike Blocks ignore the first wound for this purpose. Pike Blocks count as two units for the purpose of the Superior Numbers modifier, and resolve melee differently. Pikes and Polearms always get the Up 1 for initiating Melee against Cavalry, never the other way around. A few situations do not require a Melee card, including flank and rear attacks, attacks upon Disordered enemy units, cavalry attacking Skirmish Infantry. Otherwise, a Melee card is required to initiate Melee combat. Cavalry, Pike Blocks and some infantry in Battle Order can use a Move segment as a Melee card when winning two or more segments. Exceptions to Pursuit Checks: The following circumstances will cause a unit not to make a pursuit check. 1) Another unrouted enemy unit is in contact with the unit 2) Another unrouted enemy unit is within 1/2 move distance of the checking unit. This is half the movement distance of the checking unit, not the enemy unit. This can be in any direction. 3) Unit is a Character, War Engine, Gun or in Hedgehog formation. 4) Unit is behind CLASS II or higher linear defensive position. (i.e. walls, earthworks, etc) 5) Defeated unit is a Character. 6) Unit is immune to Morale Checks. Such units do not check for Pursuit, unless otherwise specified. * See section 13.1and 13.2 for details of the Tactical Morale Check and Morale Challenge, and 8.1 for Courage! When characters are attached to units, use which ever is higher of character or unit base resistance. Spells that affect all units/characters within an area use the resistance of the most resistant effected character/unit. Unattached Characters suffer the full effects of a Magical Attack. Attached Characters are affected as set out in 7.43. Armor is ignored for Spell Seeker, Spell Seeker 2, Vortex, Earthquake and attacks caused by Wizard death (15.6). Casting catastrophe attacks (15.6) ignore armor but consider constitution: Expert down 2; Advanced down 1; Basic no change; Impaired up 1. A well organized army with full time Household (Royal) troops. Calvin Morrison, former Pennsylvania Sate Trooper, was unintentionally translated to a parallel time line. Arriving just in time to save the Princedom of Hostigos from its enemies, especially the forces of the “Gunpowder God”, Styphon, he has risen to become Kalvan I, Great King of the new Greater Hostigos. He is anathema to the priests of Styphon’s house for revealing the secret of the Fireseed Mystery to the world, thus breaking Styphon’s monopoly on "fireseed". They will stop at nothing to wipe him and his kingdom from the face of the earth! Obligatory Optional Cards: Add Brilliant Commander card if Kalvan commands. Variable Optional Cards: Take all of the Recommended Optional Cards and randomly draw up to 3 cards depending upon the number of Obligatory and Required Optional cards used. Add the 3 cards to the Basic Deck, making a total of 31. Note: One less Courage! card and one less Army Morale card reflects the effects of Raxthar’s “Interogation” on the resolve of the troops. Berserker action only if Urgothi troops in army. * = hits vary, see Character rules. Points are calculated as 3 hits to wound (average). Fire, Melee, and Morale die types for Characters will be further modified by the results of the Character Generation process (section 7.4).